Not all birds are created alike - and not all birds eat alike! This finch feeder is specifically designed to provide these beautiful songsters with the space and shape that most suits their mealtime preference. 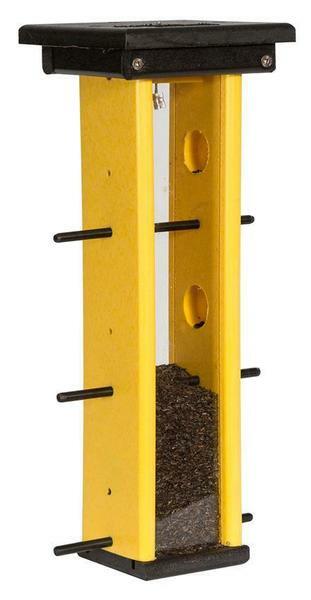 With six feeding stations and an easy-to-fill central hopper, this feeder makes it as easy as can be for you to invite finches to make your garden their home. Additionally, this feeder is constructed from poly lumber, a wonder material celebrated for its incredible durability and color retention. Poly lumber is crafted from recycled milk jugs, meaning that it's every inch as good for the planet as it is for you and your garden. Choose from a wide selection of colors to create your perfect finch feeder. If you've any questions at all, please give us a call or an email - we would love to hear from you!